The new beer soon became popular among the hard-working, prospectors of the gold rush, and in 1889 one of Johannesburg's early newspapers, the Digger's News, declared it "a phenomenal success." Full-flavoured and thirst-quenching South African Lager made with bottom fermented African Gold Barley from Caledon and Southern Star Hops from George It is brewed in 9 countries but can be found in over 40 countries worldwide. Awards: An internationally awarded and well-balanced beer, winning the Grand Champion Bottled Lager at the Brewing Industry International Awards at Burton-upon-Trent, England 1999, as well as a gold award at the Australian International Brewing Awards in 2000. 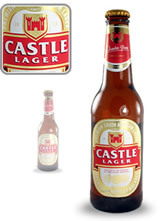 Brewing time: From barley to bottling, it takes a patient 18 days in total to create a Castle Lager. Castle Milk Stout uses a dark roasted malt to extract a full-flavoured brew. With strong hints of toffee, butterscotch and coffee, its natural bitterness is balanced by a rich, sweet taste. Castle milk stout 6% alcohol uses a dark roasted malt to extract a full-flavoured brew. With strong hints of toffee, butterscotch and coffee, its natural bitterness is balanced by a rich, sweet taste. It is classically paired with oysters, but it can also be served confidently with braised and roasted meats, such as oxtail. It complements a selection of cheeses such as matured cheddar, Gouda, goat’s milk, blue-veined or Camembert varieties. And when it’s time for something sweet, Castle Milk Stout is a natural accompaniment to dessert and coffee. Variety	100% Chenin Blanc Style	A medium to full-bodied wine made in a refreshing New World style. Palate	A lively combination of herbs and ripe summer fruit sustained by a firm acidity and a dry, lingering finish. Nose	Prominent guava aromas are supported by flavours of litchi and mango, with a subtle herbaceous undertone. Alcohol	13% Sugar	2,26 g/l Acidity	6,39 g/l pH	3,45 Vinification	Grapes came from Perdeberg in the Agter-Paarl region. Harvested at optimum ripeness, whole-bunch pressed, settled and fermented at 14°C with extended lees contact..